Some say this colorful character has her head in the clouds, but we think Rainbow Giraffe is totally tuned in to everything that really matters: Mixing tie-dye patterns with bold pink accents, smiling sweetly, having the world's most pettable fringe, and, of course, huggability. 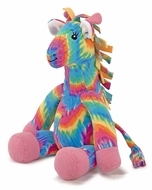 Like all Melissa and Doug Beeposh plush toys, Rainbow features super-soft microfleece, high-quality fill and style galore. Rainbow is also available with a full line of gear.